Appreciating Dance 4 Edition Written for the dance novice, this reference is a concise history of all forms of dance. Detailing the development of dance from its earliest beginnings, this guide covers the intersection of dance and religion, social dance, ballet, modern dance, tap, jazz, film and theatrical dance, and contemporary dance. This fourth edition has been thoroughly revised and includes a chapter on dance in the new millennium, along with lists of the social dances of Europe and America, basic ballet terminology, Hollywood movie-musicals, dance organizations, suggested readings, and filmographies. 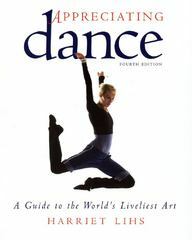 Brief biographies of notable dancers and choreographers who have contributed to each form of dance are also included.